Did You Know Your Perfume is Bad For Your Health? For Answers Read Our Current Blog Post! 3) 2 oz Bottle of Hydrating Lotion with Peppermint and Lavender Essential Oils, Very Soothing and Healing. This ALL Natural Bug Spay is AWESOME! 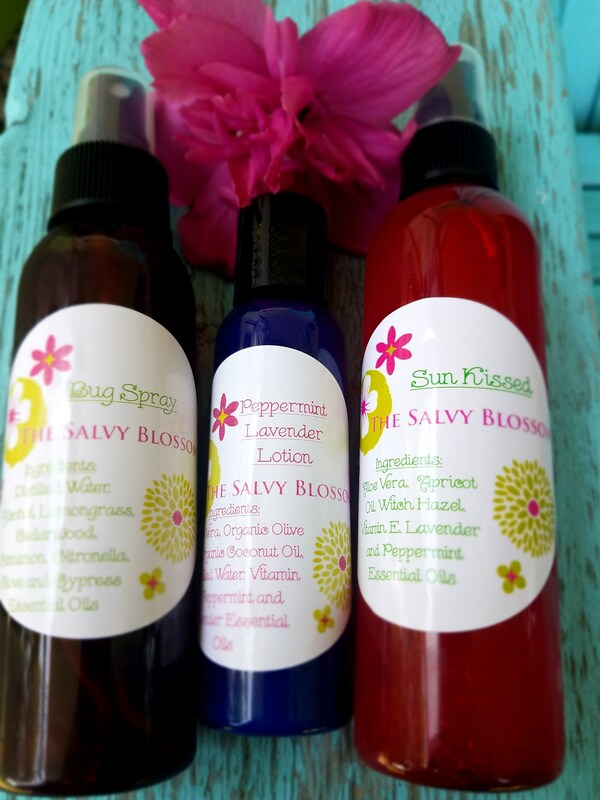 Made with Organic Essential Oils. This is a MUST try. Deet Free, Chemical Free and it works! Contains Lemongrass, Cedarwood, Cinnamon, Citronella, Clove and Cypress Essential Oils. Less than 1% Alcohol and Water. Lemongrass and Cedarwood Oils work to repel Flys and Gnats. Cinnamon and Clove Oils Repel Mosquitos. Citronella Oil repels Mosquitos and Ticks. Cypress Oil helps heal wounds and infection and aids in toxin removal. This Product is Dog safe. Just avoid spraying directly in Dogs face or eyes. Comes in 4 ounce spray bottle. 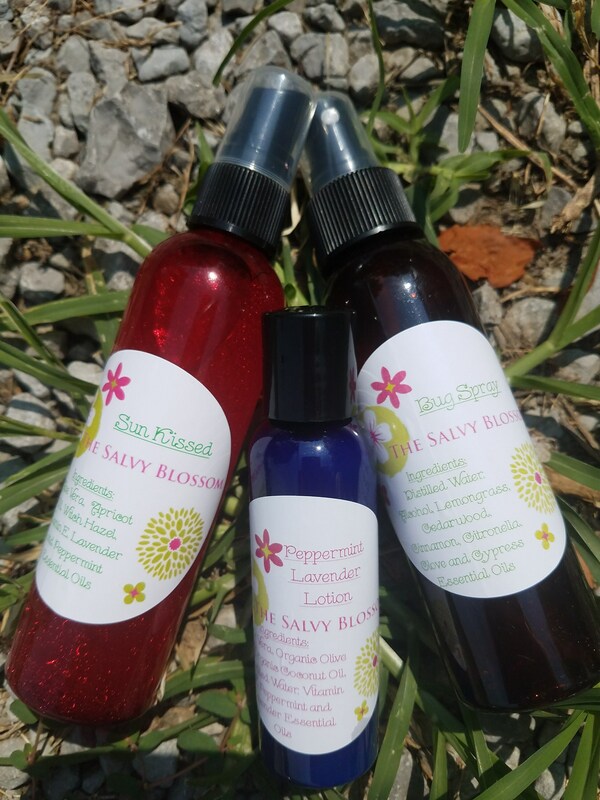 Sun Kissed is a Super Hydrating after sun spray and when you are sun burnt its less irritating to spray than rub on a lotion. This Spray is great to help you retain your tan but even better to help sooth and relieve sun burns. It contains Aloe Vera, Apricot Oil and Vitamin E along with Lavender and Peppermint Essential Oils. Essential Oil of Peppermint helps promote circulation to speed healing and has a great cooling effect. Essential Oil of Lavender is thought to be a good antiseptic and aids in healing and burns to the skin. Also very soothing. Nontoxic, Chemical and Dye Free. Contains NO Alcohol. 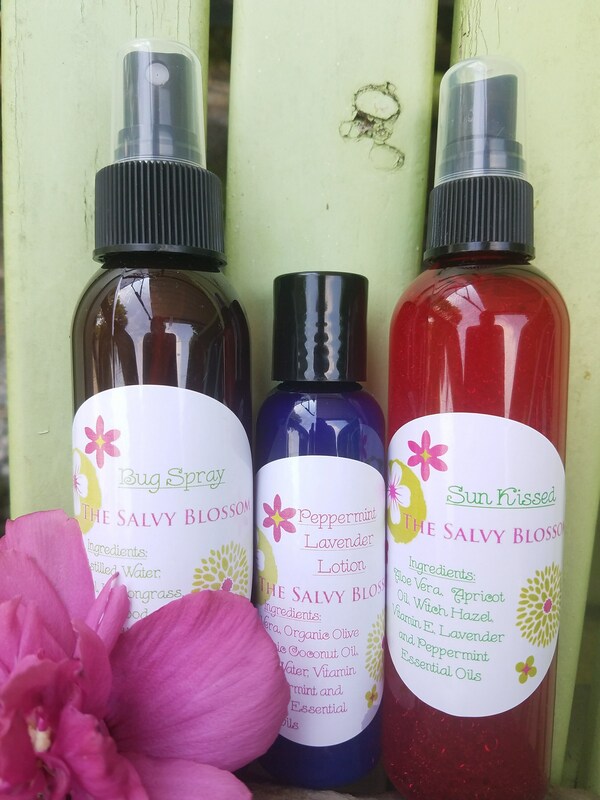 Sun Kissed come in a 4 ounce Spray Bottle. 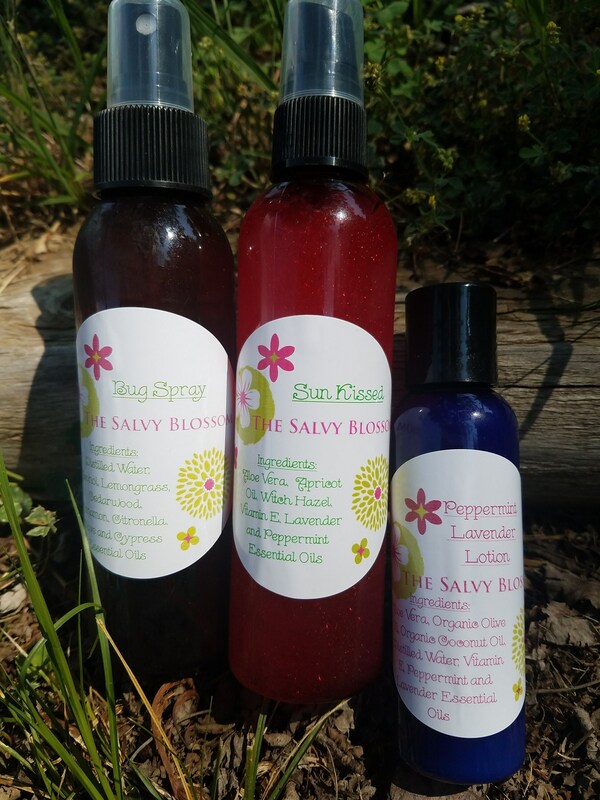 Peppermint Lavender is an Invigorating, Clean Scented Hydrating Hand, Body and Facial Lotion made with Organic Olive Oil, Aloe Vera, Organic Coconut Oil, Vitamin E along with Peppermint and Lavender Essential oils. The Aloe Vera make this lotion very silky smooth. Peppermint Essential Oil is Clearing, Stimulating and Uplifting. Lavender Essential Oil is Soothing and Balancing. 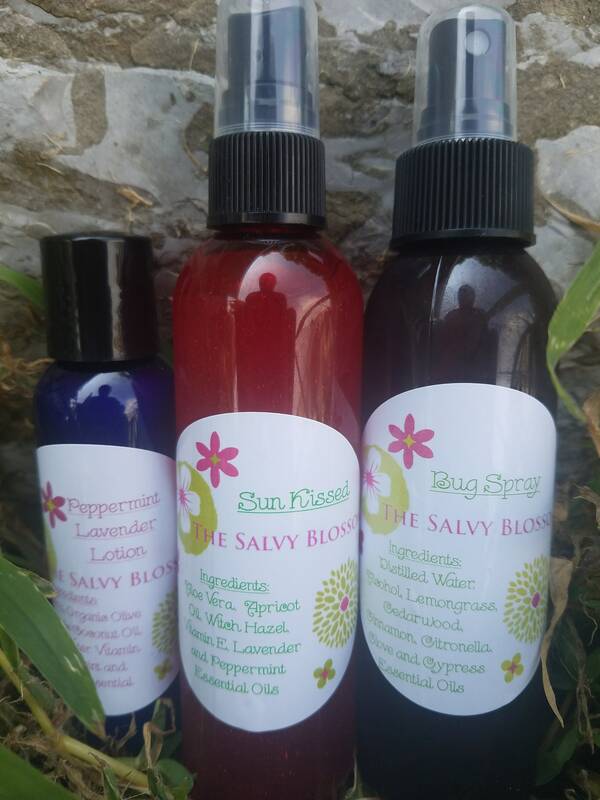 All Natural, Nontoxic, Chemical and Dye Free. No Alcohol. No Artificial Preservatives. Most of our product come in 4 ounce bottles or 2 ounce tins. However, if you would like a custom bulk order we would be happy to work with you.